The DNS standards actually define two distinct ways of following this hierarchy of servers to discover the correct one. They both eventually lead to the right device, but they differ in how they assign responsibility for resolution when it requires multiple steps. When a client sends an iterative request to a name server, the server responds back with either the answer to the request (for a regular resolution, the IP address we want) or the name of another server that has the information or is closer to it. The original client must then iterate by sending a new request to this referred server, which again may either answer it or provide another server name. The process continues until the right server is found; the method is illustrated in Figure 243. In this example, the client is performing a name resolution for C.B.A. using strictly iterative resolution. It is thus responsible for forming all DNS requests and processing all replies. It starts by sending a request to the root name server for this mythical hierarchy. That server doesnt have the address of C.B.A., so it instead returns the address of the name server for A.. 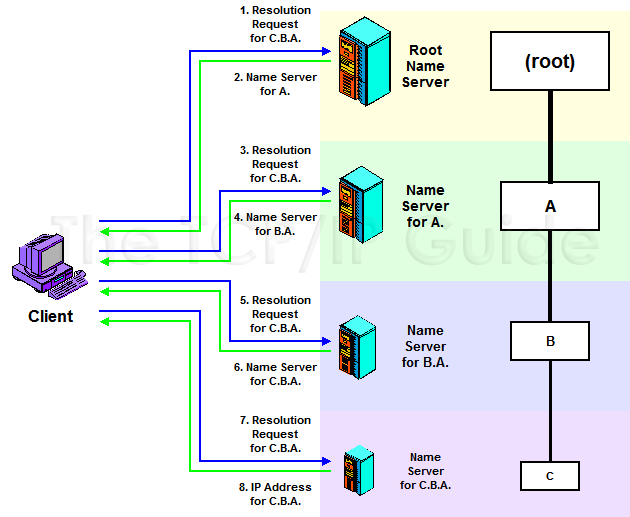 The client then sends its query to that name server, which points the client to the server for B.A.. That name server refers the client to the name server that actually has the address for C.B.A., which returns it to the client. Contrast to Figure 244.